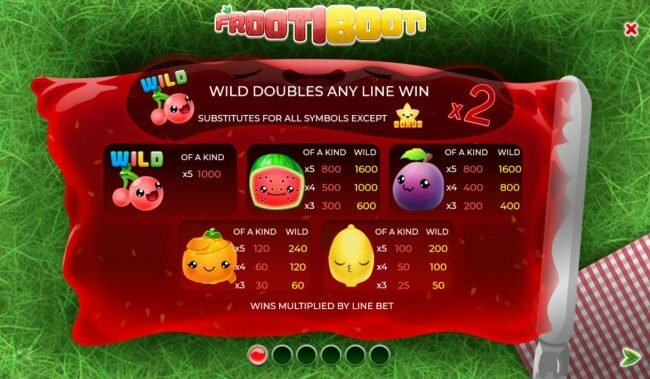 Frooti Booti is a 5 slot reel slot with a max payout of $4,000 using the fruit theme. 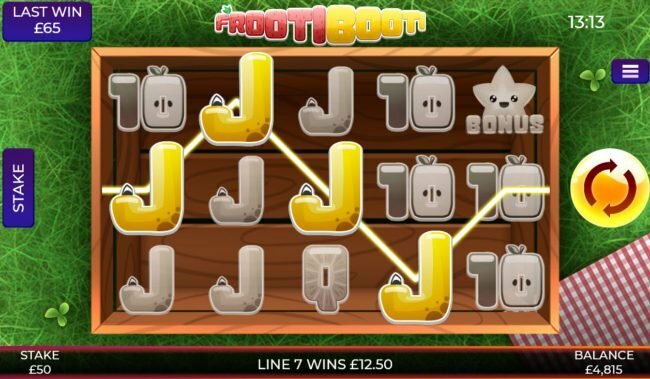 Frooti Booti Slots has not been reviewed yet, be the first to rate this slot. 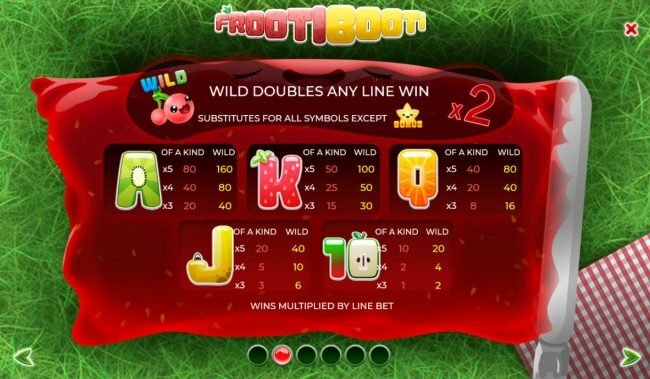 The Frooti Booti online video slot machine, a cool 20 pay-line, 5 reel slot machine. 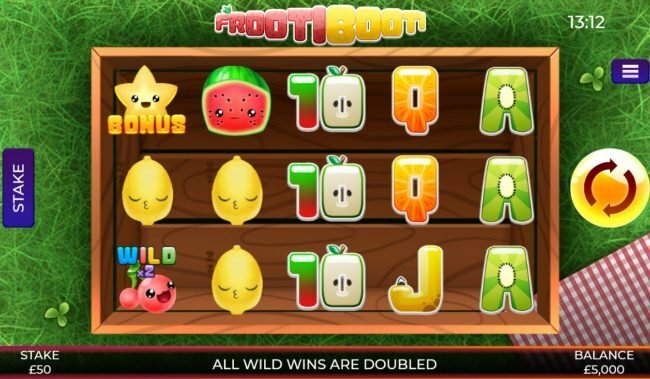 To my joy this fruit themed slot machine brings more than enough fun by featuring graphics such as watermelon, plum, orange and lemon. Additionally there are also ace, king, queen, jack and ten that delivers the final touch of this decent fruit video slot machine. 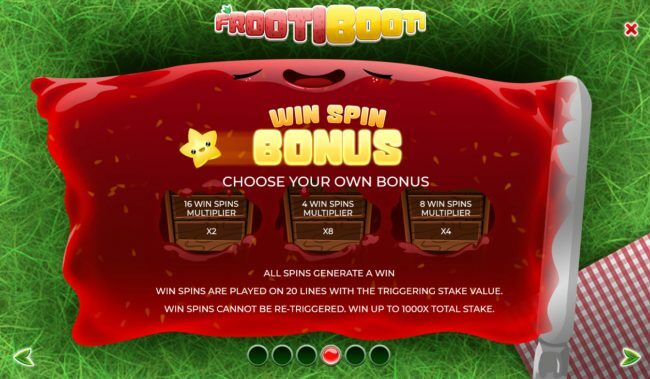 Starting to play Frooti Booti you are given the option of playing for a minumum of just $0.01 per spin. Also, you also can use all 20 lines to place a bet to the maximum of $50. 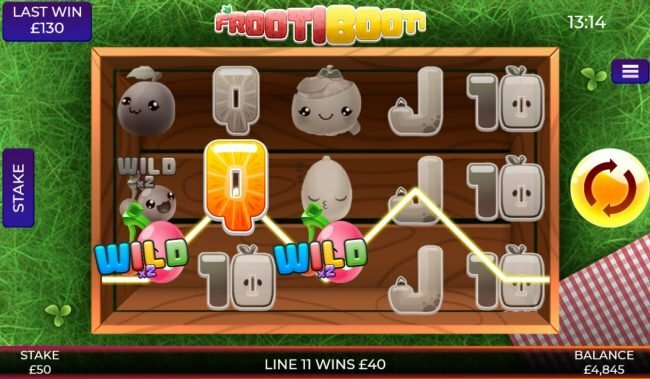 Another big bonus of playing Frooti Booti is that the slot&apos;s wild icon cherries permits you to connect pay combinations with any of the many symbols. This becomes awesome when you can have multiple paylines crossing over the wild locations. 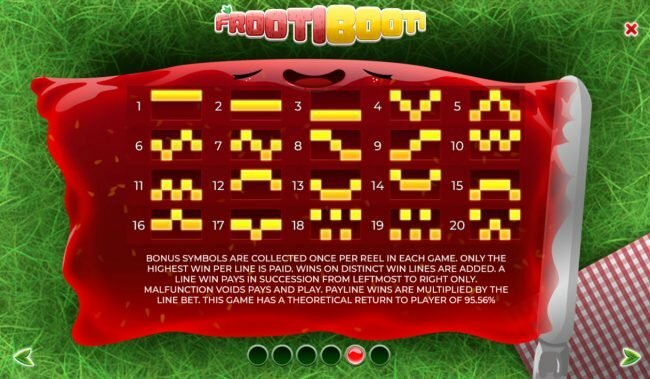 The scatter image used on Frooti Booti are a star, these symbols pay out when you have them anywhere in the video slot. These unique star images are not needing to be on the same payline to activate. It usually is a bad thing when your starting reels fail to line up but there is always an opening of still hitting a scatter win. Slots such as Dragon&apos;s Gems, Dancing On Ice and Slingo Reel Bonus deliver identical video slot play. Frooti Booti is a lot of fun to play, the fruit design is well designed and the game play is smooth. 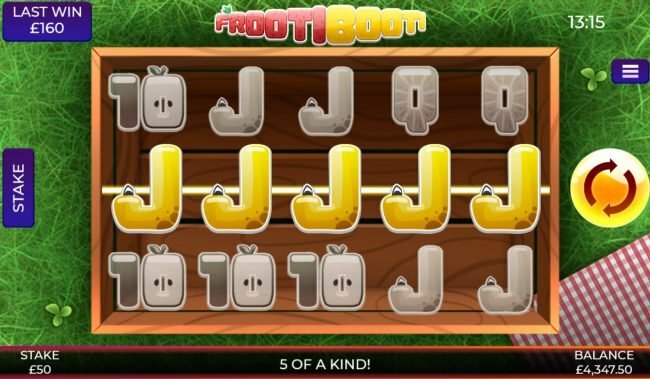 Other games like Frooti Booti share in much of the same feel. All slot machines offer a good possibility of cashing out a large amount but in the end all Slots favor the house. 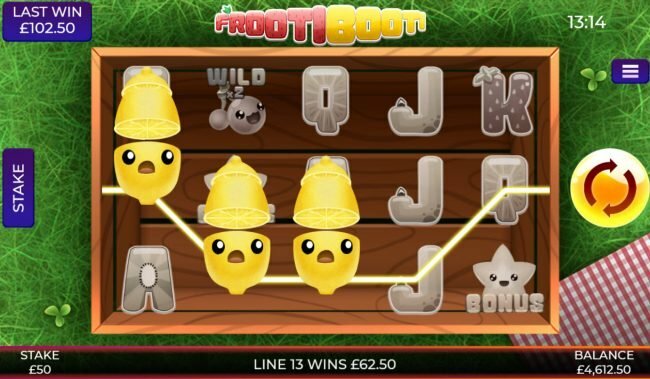 In the playing of Frooti Booti, you can really get ahead with wins, this is done by getting a bonus game win! On our online Slot reviews we like to finish with the best part to look forward to like these great features. 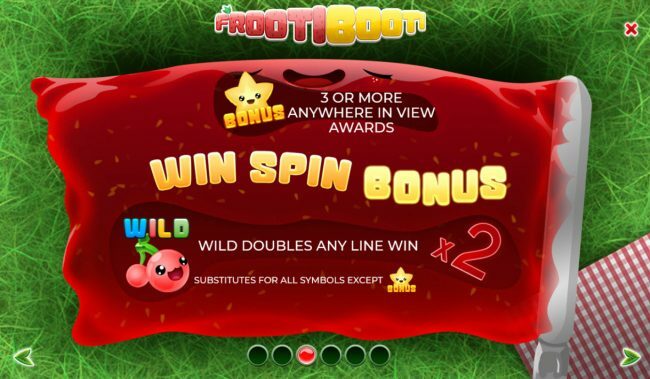 I enjoy the Frooti Booti Free Spins with Win Multiplier and the excitement it generates. This starts once you get three or more star bonus symbols anywhere in view. I have to award Frooti Booti 3 of 5 stars for the Bonus games. you almost don&apos;t pay attention to the cash balance.